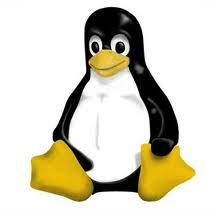 Here in this post I will explain how to compile and install Linux Kernel 3.0 and Linux Kernel 3.1 in Fedora 15. Linux Kernel 3.0.1 stable version has released yesterday and you can download it from kernel.org. If you are new to Linux then I strongly recommend you try with Linux Kernel 3.0 and not with Linux Kernel 3.0.1. You can later patch it to Linux Kernel 3.0. Ubuntu and Debian users Click Here. Follow the same steps to compile and install Linux Kernel 3.5 / 3.4.6 / 3.3 / 3.2 / 3.1 / 3.0.x in your system. To compile Linux Kernel the following are required to be installed. To install the dependencies run the following commands in terminal and type the password for the user, when prompted. Now download the Linux Kernel 3.0 from kernel.org or by using the below command. If you are trying with Linux Kernel 3.5 / 3.4.6 / 3.3 / 3.2 / 3.1 / 3.0.x then just replace the name linux-3.0 with linux-3.5 / linux-3.4.6 / linux-3.3 / linux-3.2 / linux-3.1 / linux-3.0.x in all commands below. Once the download complete move to the directory where you have downloaded the kernel package “linux-3.0.tar.bz2“. Now extract the tar file to the location “/usr/src/“. To move to the directory, for example if the downloaded package is in your Downloads directory. Use the below command. To extract the tar file run the following command. Type the password for the user when prompted. Now move to the directory where the extracted file is, or copy and paste the below command in terminal. 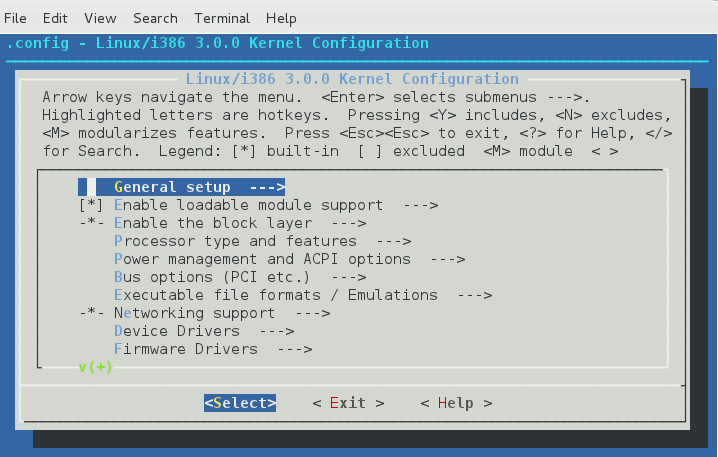 Now you can configure, compile and install Linux Kernel 3.0 in your system. Run the commands one by one and type the password for the user, when prompted. The above command is used to configure the Linux kernel. Once you execute the command, you will get a pop up window with the list of menus and you can select the items for the new configuration. If your unfamiliar with the configuration just check for the file systems menu and check whether ext4 is chosen or not, if not select it and save the configuration. Check the screen shot below for menuconfig. If you like to have your existing configuration then run the below command. There are other alternate configuration commands are available and you can find them in README file under linux-3.0 directory. The above command is used to compile the Linux Kernel. It will take some time to complete it, approximately 40 min to 50 min it depends on your system configuration. The above command will install the Linux Kernel 3.0 into your system. It will create some files under /boot/ directory and it will automatically make a entry in your grub.conf. Thanks! i upgraded to 3.0.3 with no problems thanks to your guide! but im getting following error can someone help me out plzz..
You are trying to compile the older version Kernel 2.6.x and following the procedure for 3.x. 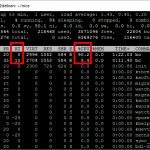 Your System running on Fedora 15 and why you are trying with older version? In Fedora 15, I din’t try compiling the older version. If you really needed I will give you the procedure soon. hi. I fixed error linux/videodev.h. I think you pratice project add system call ( so I too, lol ). You can coppy videodev.h in linux-2.6.32.46 to /usr/src/include/linux . Then remake file . Thanks for the info, It may help someone. Great work dude. just a note, use make rpm ( helps in adding/removing different kernel images), Also, by default you are not exploiting your multicore cpu’s so use make -j(n) where n is the number of jobs you want to run concurrently. Hi, thanks, clear and easy ! I have a question… I use Fedora 15 . 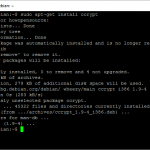 With your help I could install successfully 3.1.0-rc7. 3.1.0-rc7 : 910 M !!! It seems my kernel is oversized… is it normal ? is it coming from my kernel configuration ?? Hi, I’m looking for steps to compile 2.6.x kernel in fedora 15, can you make tutorial for it? Follow the same steps to compile kernel 2.6.x in Fedora 15. Its working I have tested. Thank you for the tutorial. I finally compiled the kernel. However Im still very new to this linux thing, so I have few questions, hope you can help me. 1. How can I delete the compilation + installation result, since I compiled some versions of kernel, I want to delete some of them. 2. How much space does this compiled kernel take? Is it as much as the original fedora 15 installation? 1. You can delete it directly. If permission denied use command line as root user. 3. Yes, you can but Why you want to delete the default version? Fantastic! Worked on first try. Very useful tutorial, great work. Excellent tutorial, worked without any glitch. Upgraded to 3.1 from Fedora 15. Great tutorial! Thank you very much for sharing. I was able to upgrade Fedora 14 to 3.1.1! It works fine for me as well. Thanks so much – so clearly explained. tell me its the same in kernel 3.3 rc2 ?? Fedora 14 + kernel 3.0 —- rules !!!!! How do i remove kernel that i compile and install ? Log in using the previous Kernel and Delete the directory of compiled kernel then update your grub. do you mean to delete /usr/src/linux-3.X?? What is the advantage of doing that in comparison to the usage of the F17-rawhide kernel version? I do it that way in F16. Very Very good!! I tried a number of tutorials but non of them worked! THIS IS THE ONLY TUTORIAL THAT worked. Very much appreciated. Keep up the good work!! Anyone try that tutorial in fedora 17 beta and kernel 3.4 rc ? Very useful.. but i have one query,bzImage in x86/boot was missing how to get it back? 1.	how can I get/install also the kernel devel & header? as intel core i7 sandy bridge and ivy bridge? Why you are not used the make bzImage command? I followed your instruction and compile kernel modules Fedora 3.6.11 on Fedora 17, which uses this version of the kernel. When I tried to install a module, insmod openvswitch, I got an error … “Could not insert module. Invalid format error.”. Any one has any hints of what happens?